Jean-Claude Juncker has denied describing Theresa May as "nebulous" after comments he made about the Brexit debate prompted the British Prime Minister to confront him. 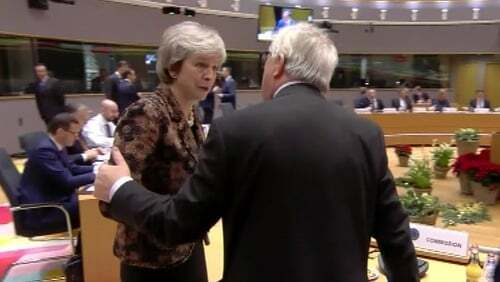 Footage of a heated exchange between Mrs May and the European Commission President appeared to show the PM sternly telling Mr Juncker: "You called me nebulous." Official video of their exchange, as other leaders took their seats, showed Mrs May repeating herself while the former Luxembourg premier held her by the arm and shook his head before the Dutch Prime Minister Mark Rutte arrived to interrupt them. Mrs May described the encounter as a "robust discussion", but Mr Juncker said Mrs May was "kissing me" after she "checked" the comments he made on Thursday night. He had told a press conference the Brexit debate is "sometimes nebulous and imprecise", but was forced to clarify his comments the following day. Mr Juncker said he was "not addressing" Mrs May in his remarks, and instead intended to direct his criticism at the "overall state" of the Brexit debate in Britain. Mrs May appeared to berate Mr Juncker over the remarks and, asked about the conversation, said: "I had a robust discussion with Jean-Claude Juncker - I think that's the sort of discussion you're able to have when you have developed a working relationship and you work well together. "And what came out of that was his clarity that actually he'd been talking - when he used that particular phrase - he'd been talking about a general level of debate." Mr Juncker was later asked about the video clip, and said: "She thought that I did criticise her by saying yesterday night that the British position was nebulous ... I did not refer to her but to the overall state of the debate in Britain." He added: "I was not addressing her, and in the course of the morning after having checked what I said yesterday night, she was kissing me." The previous evening, Mr Juncker told a news conference that Mrs May's pitch to the summit for help on Brexit was "nebulous" and "vague". Diplomats said other leaders made similar complaints directly to the beleaguered British leader during the talks.